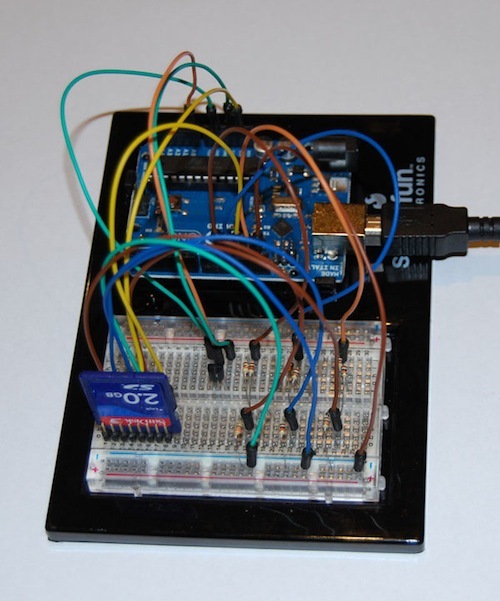 Build your own datalogger for your Arduino! Here at SparkFun, we are suckers for useful, scrappy hacks. Things like our hot-plate solder method and our use of pogobeds in testing are prime examples. That's why this cool header hack is right up our alley. Check it out! Mark, a SparkFun customer, received a SparkFun Inventor's Kit for Christmas. After blasting through a few of the circuits, he decided to modify one of the included examples (which we encourage!) and implement a datalogging aspect while using the temperature sensor. The thing we really like about this is how he hacked a couple simple headers to allow him to use a standard SD card. This is the kind of scrappy hack we really enjoy. Mark saw a problem and created a clever solution out of the materials he had on hand. Awesome. Read more about Mark's datalogging at his website. Great work, Mark! I've used this method a couple of times for prototyping, and its great. I don't know about any of you, but I would rather buy a 2 dollar SD Card holder for something like this. Not saying this isn't a nice hack, but it puts a lot of wear/tear on the SD Card pins, and after enough insert/removal from the pins, it can start to remove the metal coating and just never work well after that. Also, I would be worried about noise, because those are basically antennae. I don't know, but I tend to be worried about the small things like that. Overall, nicely done clever hack Mark. Its nice if you don't have time to wait for an SD card holder to prove a concept. If there's anything anyone has in the world is time. Time always moves forward, so what is the difference between a few days for an order? (Of course I am not taking into account competitions and project deadlines). One thing to keep in mind is, engineering students have the idea of, "If my design breaks, or I fail at doing a proper design, people WILL die" pounded into their brains. The post was mostly that coming out. SD Cards are cheap. I would have ordered a new one, along with the proper break-out pins. At the rate most engineers are paid (even a fresh grad, at $50k/year) it's not worth the 10-15 minutes of debate. :P.
Depends on the size. ;) CAUSE SIZE MATTERS PEOPLE! Actually since time is finite, its precious. He just wanted to learn. He can learn just as easily with a bent pin header as he can with a real SD card holder. The difference is, he can learn right away, rather than wait two days. Then in two days, he can learn something else. So many people have old SD cards lying around, its entirely possible that he didn't care if it wore out. If you don't need it, its basically worthless, so if he can get some value by learning from it then its worth it even if it wears out. That's why time management is key. He could have ordered the card holder and worked on other parts of the project while the connector was being shipped. Improvising like this decreases costs and is sometimes vital when one has a very close deadline, but in this case, he appears to have both the time and money to buy a proper connector. Not going to deny that, but if he ordered something and it comes in, he can learn something until it comes in. It's all about time management. It's not like the knowledge has an expiration date. Honestly, one of the skills I value the most is the ability to rig something with a shoe string budget and very little time to prove a concept. I find little hacks like these invaluable when you are working on a design for something. All you need to do is prove one little point, then you can move on. When I start laying out schematics, those little things nag the crap out of me. If I can write a few lines of code or tack some things together on a bread board to relieve that and move on in my design, great! Something I realized after leaving school: Time is often the most expensive resource on your project. If the difference between making and not making my project deliverable was a few damaged SD cards, I'd damage the SD cards. I guess it depends on your projects and the deliverables. I always find this is true, even at my current employer, we'd rather than an extra 2 weeks to do something right and get the proper solution done rather than hastily push something out the door. The way Mark did his setup seems to be more of a rapid prototype of a project. I would rather see a polished deliverable rather than a rapid prototype dressed up. If the pads on the SD wear out, or if the circuit is too noisy/unreliable in operation, just solder a single row of pins directly to the SD. Problem solved. Whatever. It's cool. It's not necessarily intended for anything other than fooling around. I don't think it's a bad idea at all. Great way of prototyping and as long as you don't make the pins press down too hard on the card, it's not gonna hurt it. as for noise, pin length isn't too different from a normal card holder. Of course you'd use a actual SD slot in a real design but most of them are surface mount so no good to quickly experiment with on a breadboard. With the antenna concern, yeah it is not a big issue in this case, since the speed of data is low, but the concern of data corruption is always there, especially in an unshielded hack like this. Looks like a great idea for prototyping to me. I suppose you could plan ahead and buy a real SD card holder breakout for breadboarding but I bet it ends up soldered into a permanent project sooner or later and once again you are looking for something quick to use for the breadboard. Another thought... if you didn't want to ever use the SD card in a regular device again... I wonder how well it would work to take this, turn it upside down and dip it in epoxy to make a permanent pin-header SD card? It wouldn't be too difficult, but you always run into the concerns of data corruption if not done correctly, and the solid state storage of the SD Card to eventually die (wear leveling issues). You could always go with a MicroSD Card adapter to an SD-MMC Card. This way you only need to use a MicroSD and not worry about the permanent aspect. Good, cheap hack. I've been soldering pins to sd card adapters. I'll have to try this. Antenna. Heh. That's funny. I've got a piece of aluminum foil I use as a temporary AGC fuse replacement. 1,000,000 awesome points to me, right? You could earn points if you explained how you cut it to the proper amperage and fastened it so you didn't burn the connections. Anyone seen this before? Found it on Hackaday a while ago. A very similar hack, worked well for me too! Can't believe it isn't incredibly unreliable. Cool idea. I've seen a similar hack, using an old floppy drive connector. You could use an SD card shell for a micro SD card and secure it permanently to the pins. The micro would slide in and out as usual from the shell. Re: technique, you can use a vice and one pair of needle-nose pliers to first bend all the pins inward. Then "rotate" the tips outward. Sometimes it helps to have a second set of pliers (to take the stress off the base of the pin). Looks to me like you bend the outermost 1/8" or so outwards by maybe 30 degrees, using a pair of needle-node pliers. Then just bend the pin inwards at the base with your finger. That is pretty nifty... Is there a special technique for bending the pins in the middle? I don't think there is any special method. He just describes it at "gently bending" the pin. Neat idea. 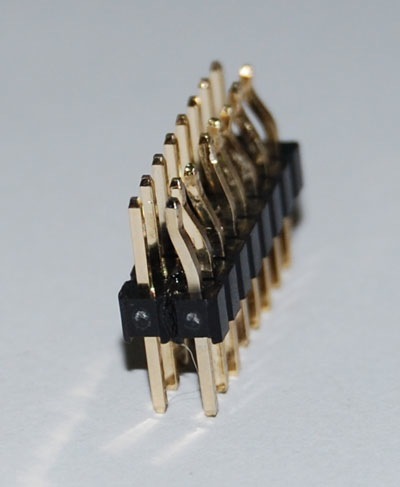 I saw somewhere that someone took a single row of headers and soldered them to the SD card itself. I suppose this method keeps the SD card useable for things other than prototyping lol.